I first saw Thomas Grocery and bought a Baby Ruth and a root-beer there shortly after I arrived in this neck of the woods in the early sixties. To tell the truth, it doesn’t look much different now. 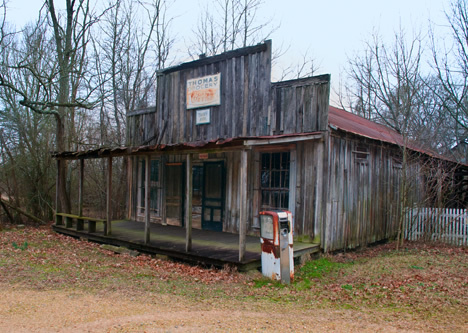 Tarry, Arkansas is tiny. Size in this case h0wever has nothing to to with treasure. And tiny Tarry has a treasure manifested in Thomas Grocery, which has survived nicely and is still standing tall after a lot of years. Regrettably. I have not done my research on Thomas Grocery past admiring it for a number of years. Click on the old building to see some that are now gone. Unfortunately, a lot of older structures have met their demise while Thomas Grocery has survived. We took a look at a downtown building and an old barn that are now history on the Photo of the Week page at Corndancer dot com where this story started. And soon. I did the Thomas Grocery shots in 2009, with the intentions of following up to get more information on the store. Unfortunately, we are all familiar with where the road paved with good intentions heads. That said, now that I have finally published the winter shots which show the front of the store, I will make it a point to go back and get the summer shots and this time get information. Looking at Thomas Grocery head-on, an inviting look from days gone by. The bench on the front porch tells us that social pursuits shared importance with merchandise. 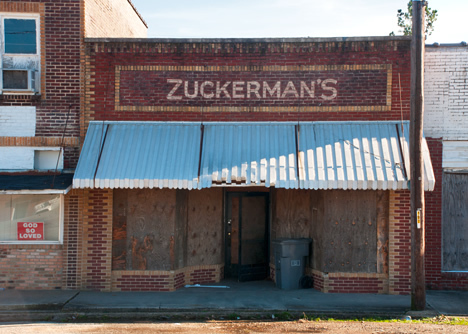 Further to the north and east, in the Delta at Hughes, an old store, Zuckerman’s, sits empty along with its neighbors. 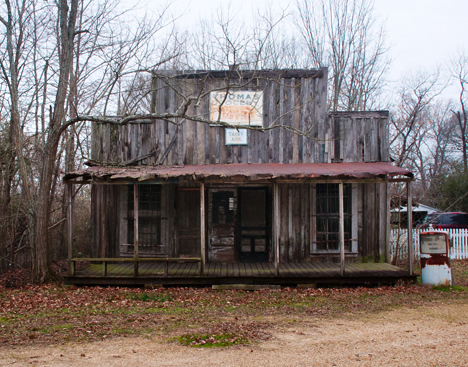 Hughes, like many small Delta towns at one time was a vibrant community with thriving businesses. Mechanization of agriculture and a whirlwind of cultural and economic changes swept through the Delta like Moses’ plagues on the Pharaoh and when the dust settled, the towns were a shell of their former selves. The appearance of Zuckerman’s was impressive to me because the lettering and layout of the sign fit well on the structure as if a real designer had a hand in it. Swinging back closer to home in Cleveland County, Arkansas I happened across this old barn. Turns out the barn is only about 40 years old despite the fact that it looks much older. The owner explained that he built the barn from materials salvaged from an old family home on his property which was built around 1905. About 10 years after he built the barn, he removed himself from raising cattle and the barn was no longer used. This old barn fooled me. I surmised that it was substantially older than its 40th year. It is however, built with lumber which is about 107 years old. 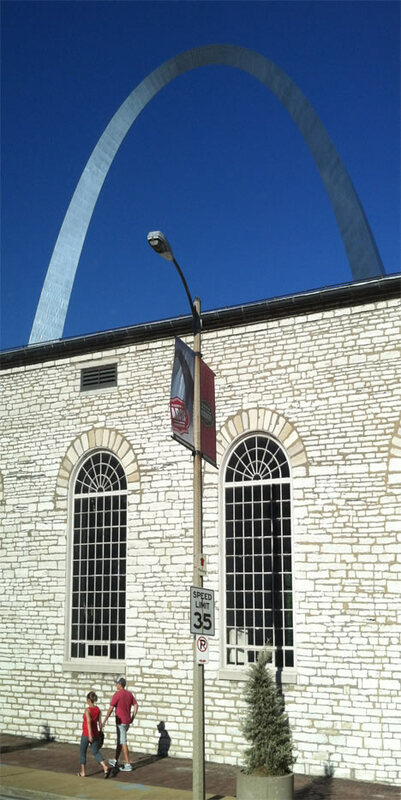 Though the Arch at St. Louis is alive, well, and non-threatened in the foreseeable future, I was able to grab a good shot of it last week while in St. Louis to watch the Cardinals get creamed by the Chicago White Sox — and since I write the rules here, I’m including the picture. Got the shot while stalled in traffic, a blessing from a curse. Lovers stroll hand-in-hand with the mighty St. Louis Arch in the background. Got lucky. I shot this with a phone camera from through a bus window. Will miracles ever cease? 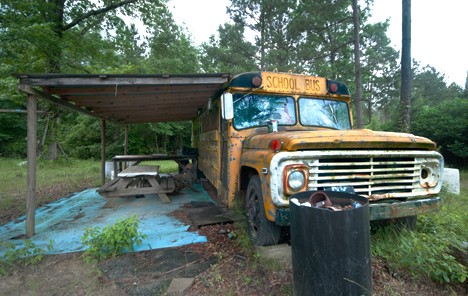 You are looking at a rededicated school bus now serving as a cabin at a deer camp in LA (lower Arkansas). The veranda is floored with a blue tarp. 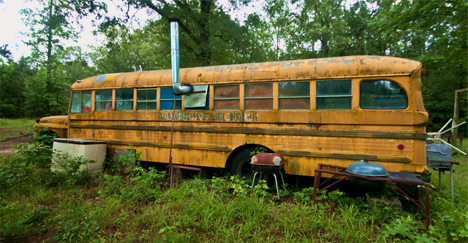 Though the bus is showing its age, the members of the club keep the place clean. From the looks of it, they’ve been working on the project for a while. Click on the bus for more pictures and a story. Returning from seeing my oldest granddaughter graduate from high school in May, 2009 at Bossier City, Louisiana, I meandered through north Louisiana and eventually entered L.A. (lower Arkansas) where you can’t get much lower. After a short map recon, I found a likely gravel road which led to the inner sanctum of the boondocks, a desirable place. All of what I saw was unexpected, even for LA, beginning with this field-expedient deer camp. See how the story started with more pictures of the deer camp bus on the Photo of the Week Page at Corndancer dot-com. The deer camp has been there a while. They have a well-established camp fire location, an unwritten but well understood requirement of any self-respecting deer camp. Otherwise there would be no fire to sit around while spinning tall tales and “tellin’ lies.” There is also a weathered but sturdy station for dressing the kill; Dressing being the nice words for stringing up, gutting, skinning, and butchering the kill into palatable venison. 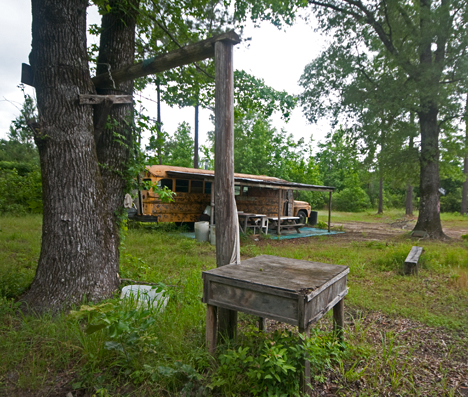 The well used and weathered dressing station at the deer camp is sturdy and is a respectable distance from the living quarters. The bus from the back. If you look carefully at the sign on the side of the bus, you can see that it had several lives before it wound up as a shelter for good ol’ boys in the LA boondocks. 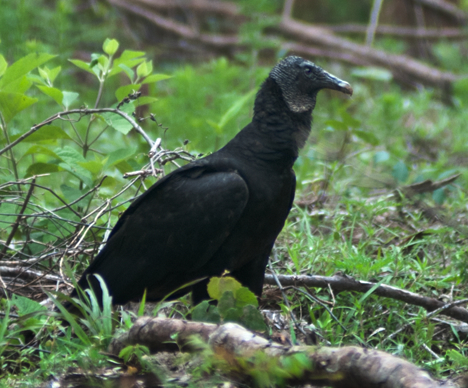 Not far from the deer camp, I spotted some “grave-yard chickens,” my late Uncle Ralph’s term for buzzards. All but one scattered as I brought my camera to bear. He was not spooked by my actions and posed nicely. They will not win any beauty contests on the ground but they serve a noble purpose and do it well. This buzzard looked up from his munching after his comrades had taken wings. I was grateful that he stuck around. As mother nature’s clean-up crew, they do an admirable job. 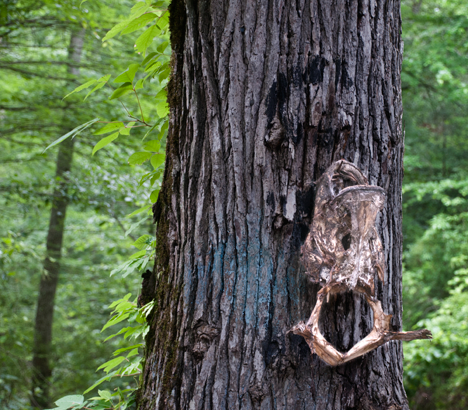 Deeper into the boondocks, I happened across what appears to be redneck voodoo, if there is such a thing. At the end of a bridge over a small stream, (AKA “brainch” in LA), I saw the head and some connecting body parts of a large fish nailed to a tree. Birds, critters, and bugs have picked it clean. I am not making this up. You can see it with your own eyes. I am more or less flabbergasted by the fish head and body parts nailed to a tree. This is a first. It could be redneck voodoo. Who knows? It is on the same road as the school bus deer camp. The fish appears to have been a largemouth bass. Maybe the ol’ boy caught it cleaned it and could not afford the taxidermist so he nailed it where he could see it. Alternatively, it could be some sort of nefarious curse. If it is, so far I have avoided any untoward vengeance it may spawn. Unless you count occasional indigestion and moderate dandruff. See higher resolution pictures of all of this week’s Corndancer and Weekly Grist pictures in our Weekly Grist Gallery. Back in June 2010, I made a trip to Overton Park, AKA The Memphis Zoo. The zoo was featuring a couple of pandas whose presence created a temptation I could no longer resist. Though I went for the pandas, I got more than I had bargained for including the climate. I have sweltered in my time, but that weekend pegged the needle for a combination of heat and humidity the likes of which I had not experienced since the early sixties when I was traipsing about in the jungles of northeast Thailand. At the end of the day, I decided that the price of seeing some fine critters do their best to act up was some sweaty discomfort which I survived. Looking back, I would do it again in a heartbeat. Click on the Panda for more pix and a story. The trip afforded energetic performances by bears, big cats, gorillas, monkeys, and the people who were watching the critters. You can see the start of the story with some panda, polar bear, and tiger pictures pictures on the original Corndancer Photo of the Week page. See the rest of the story on our original Weekly Grist post. I also created an album with 42 critter pictures including tigers, pandas, monkies, gorillas, and more from the trip in our Weekly Grist gallery.